to the car life of the people throughout the world. Since the foundation of the Asahi Corporation in 1961, we have continued to contribute to the additional comfort in the lives our customers through the accumulation of daily study in an environment marked by a high level of technological skills and the relentless spirit of inquiry. Currently, with car audio components, electrical component development, and production enterprises serving as the core of our business activities, we have been able to achieve high commendations from our customers for our high standards in terms of quality, function, and dependability of the products that we deliver to our markets. Also, as we continue to promote the planning and development of products that quickly reflect the market trends and the needs of our customers, we continue to make major advances into the field of electronic parts. We hope to be able to substantiate our proposal for providing “additional charm to the car life” of our customers through our attempts to establish multilateralization in our business concerns. 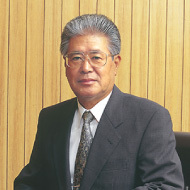 The Asahi Corporation acquired ISO9001 certification in 1998. As an effort to further deepen our dependability in the world market, we also received our ISO14001 certification in 2001. We will continue to confront environmental problems from a global perspective as a responsible enterprise doing business in the 21st century. With regard to CSR, our efforts are carried out under the guidelines of “customers first”,“coexistence with society”, “ fair and open business transactions” and “wholesome management through dialogue”, and it is the role of ach and every employee to assume an active role in contributing to society through his/her actions. We would like you to continue giving us your full support.